You will find The Big Five in many variations. The most known is the Safari-Big-Five, originally the five most difficult to kill animals in Africa: buffalo, lions, leopards, rhinoceros and elephants. We don't have any of those animals on Lesvos. But the Lesvorian novel Daphne & Chloe by the writer Longus shines amidst the Big Five of Great Greek Novels: Kallirhoë by Chariton, Ephesiaka by Xenophon of Efese, Leukippe en Kleitophon by Achilles Tatios and Aethiopica by Heliodoros of Emessa. I must admit that I have never heard about these novels (except that of Longus). It is because Wikipedia says it is so. There is no Big Five of Lesvos on Wikipedia, but I have invented my own. The list starts with the almond, apple and pear blossoms. In Japan they have huge celebrations during the flowering of the cherry trees. Lesvos should take that as an example: because when part of the island is covered in pink almond clouds, the atmosphere is as magic as at the cherry blossom festival in Japan. As soon as the new year begins you see the buds of the almond swell and open, continuing well into February, even though Winter still reigns the island. The sweet perfume is pure happiness for the nose and the ears are spoiled with a free concert from the bees who noisily awake from their hibernation. Almond blossoms are followed by the wild apple and pear blossoms, both of which lay a delicate carpet of lace over many darkened mountain sides, another memorable spectacle. The second group of the Big Five of Lesvos are next to emerge from their buds: from February onwards (until June) wild orchids start flowering, having about hundred species on the island. Many of them are rather small, some just a few centimeters, like the cute little sicula (Ophrys sicula), one of the first to appear. One of the biggest – also an early bird – is the Giant Orchid (Himantoglossum robertianum), that can reach up to one meter in height. Orchids love to look like insects, in order to attract them and each species has its own insect. Sometimes things go wrong: maybe due to an imperfect disguise or a stupid bee, and sometimes the wrong bee will end up on the wrong flower and this way a new species of orchid can be created, an unicum in the world of plants. In the past a drink was made from orchid bulbs, salep, mostly consumed instead of coffee. In order to protect orchids, making salep now is forbidden in Europe. But such a potent giving drink is difficult to remove entirely from a culture, so here and there you may find this powerful drink, although there are no longer masses of people hunting orchid bulbs in order to warm their hearts or perform better in bed. By December and continuing into January colourful anemones revive the fields. When every shade of white, pink and purple had their turn, the red ones come, as the precursor of the red flood; because as the red anemones fade away, the poppies take over in April and May. Fields with many coloured anemones are pretty, but the poppies who paint entire fields in bright blood red are the real champions. Their performance, resembling the famous tulip fields in Holland, may well melt your heart and seeing a single bright red poppy amidst yellow and purple flowers can definitely accelerate your heartbeat. Every year it's worth repeating the divine adventure of roaming over the island to be continuously surprised by these papavers, whose bright colours dominate the landscape for weeks. On the neighbouring island of Chios there are tulip fields, just like in Holland (and just like the Lesvorian poppy fields). There they are called by the musical name 'Lalades'. On Lesvos there are not as many tulips and – as far as I know – they do not have such a pretty name. They flower on high mountain slopes, mostly well hidden by other flowers, like on Mt Lepetimnos, high above Agiasos and Agra, or close to Klapados, with the exception of one place, between Vrissa and Vatera, where thousands of them, well hidden on a steep slope, expose their petals amidst grey pine trees, and create a fairy tale scene. These are the Tulipa undulatifolia, beautiful red tulips with frivolous undulated leaves. I now can perfectly imagine how there once was a vivid commerce in those bulbs: wandering across that part of the forest leaves you with such respect for the beauty of nature. (rhododendron luteum). They throw themselves from the top of the mountain Ilias (above Parakila). Driving along creepy steep slopes, across an endless dim pine forest, lit up here and there by some orchids, you will come across the yellow rivers of flowers descending the dark slopes. And after each bend in the road you'll meet another river shining bright between the dark trees and the enormous rocks that were placed there millions of years ago by volcanos. This is the only place in Europe where you can enjoy their intoxicating honey sweet perfume, which is not necessarily without risks. Once upon a time, when an army was retreating through Turkey and they had to fed themselves with whatever they could forage, they found a tasty honey and ate and ate and ate. During the night all the men became very ill and fell unconscious. They were lucky that there had been no enemy around and so they survived. 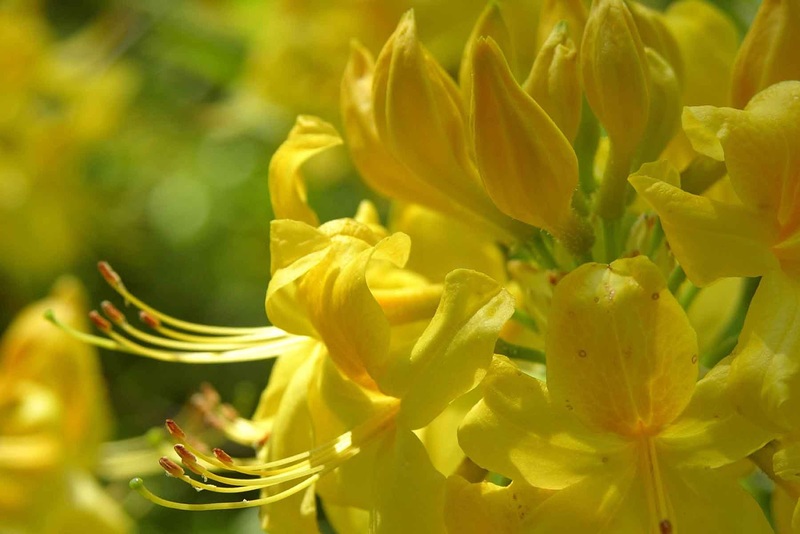 Later on scientists worked out that they must have eaten honey made from the yellow Rhododendron. Of course there are other beautiful or rare flowers to be found on Lesvos. But if there will be a Big Five of flowers on Lesvos, these are the plants you really have to see in their natural habitat: clouds of almond blossoms, wild orchids, the poppy fields, hidden tulips and the rivers of the yellow Rhododendrons.